Sometimes an MVP is decide almost solely based on how they finish the season. 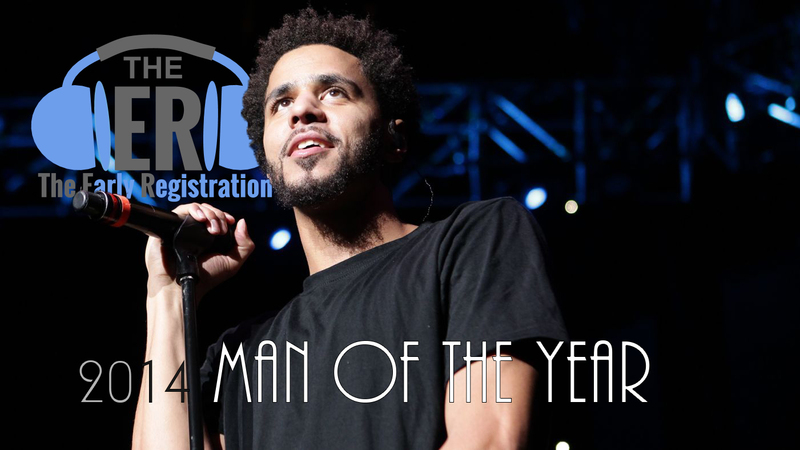 Such is the case for 2014 and our Man of the Year, J. Cole. In what may have otherwise not been possible, thanks to a lackluster year in rap, J. Cole single handed saved rap music from having a disastrous 2014 and he did in just one month’s time and virtually out of nowhere. This is not to say that rappers like Big Sean, Childish Gambino, Run the Jewels and several others didn’t have a great past 12-months, but Hollywood Cole is the real MVP. The roots of J. Cole’s amazing 2014 started in his childhood, specifically at “2014 Forest Hills Drive” in Fayetteville, NC. This is the address of Cole’s childhood home, a home that Cole would later repurchase in June of 2014, that would inspire his surprise album of the the same name. On November 16th, music fans had no idea that Cole was working on a new project, when we at The Early Registration were the first to give the news that J. Cole’s 2014 Forest Hills Drive both existed and would be released in less than a month. Soon after, Cole would formally announce his third studio album and the promotion was far from traditional. No singles, no features, no heavy promotion, just a great quality album and a few intimate listening sessions with fans in the same home that gave the album its especially personal quality. While you may expect such a secret and out of nowhere album to lack in quality, 2014 Forest Hills Drive did not disappoint. We (among others) gave high praise to Cole’s latest efforts, as we named the album one of our Top 10 Albums of 2014. Not only was 2014 Forest Hills Drive one of the best rap albums of the year, it was also the best selling rap album of the year. Upon its release, FHD debuted at #1 on the Billboard 200 chart (knocking off Taylor Swift’s 1989), selling over 300,000 copies. This absolutely shattered all other rap albums in first week sales in 2014, the next highest being Rick Ross’ Mastermind which sold 179,000 copies in its first week. And how did J. Cole respond to the numbers? Addressing the sales on his Twitter, Cole said “The #’s are humbling. It’s a win for all artists and fans and a clear message to the industry. No singles no features. Stop serving trash.” Well said. Also, the man definitely deserves the revenue considering that earlier this year he went on his second “Dollar and a Dream” tour, performing his classic mixtape The Warm Up for fans throughout the country during a number of secret and sold-out concerts where all tickets cost just one dollar. On his 2013 track ‘Crunch Time’, Cole spit “this is for my n*ggas in the 4th quarter”, and no one had a better 4th quarter in music this year than J. Cole. These past 12 months were not best period of time for rap music, and it would be hard to find someone who thinks otherwise, however the hip-hop world owes J. Cole a great debt for what he achieved this year (again, out of nowhere). Year-by-year, Cole is proving why he deserves to be viewed as a top MC in the rap game, up their with his peers like Kendrick Lamar and Drake and his idols like Kanye and Jay-Z. This time around Cole took 2014 and made it his own, which is what makes him our 2014 Man of the Year.